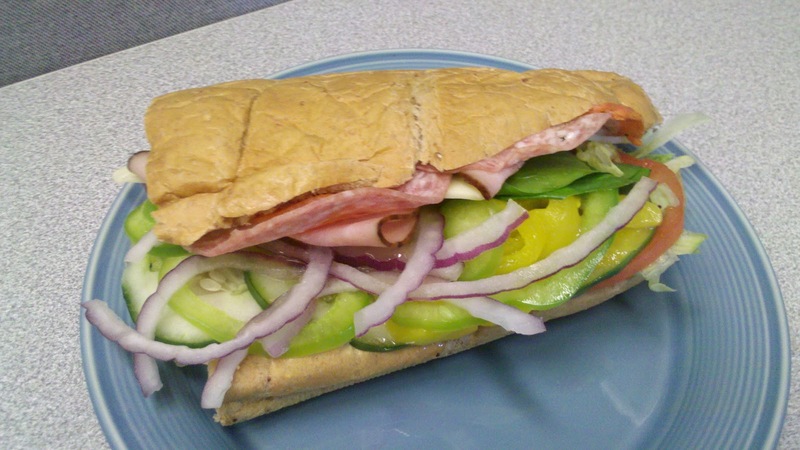 Subway Sub of the Month – Italian B.M.T. For the month of July 2011, Subway is featuring the Italian B.M.T.® as their featured $5 Footlong. This option has been a longstanding staple of the Subway sandwich menu, it is not typically available at one five dollars. At first thought, the name seems like a creative spin on a BLT (bacon, lettuce and tomato) sandwich. However, the BMT is not named for it’s components. It’s actual composition is with Genoa salami, spicy pepperoni, black Forest ham. If you have read my previous reviews of the May and June $5 Footlongs, I have been fair, but critical of the nutritional value of the featured subs. Alas, this month will be no different. Unlike the Chipotle Chicken and Cheese offered in June, this sub is already exposed in the nutritional information provided at Subway. There is even a nifty little calculator available on their website if you’d prefer to customize your toppings (click Nutrional Facts below the animation, then click Your Build). In my opinion, the sad fact is although Subway is offering one of it’s more popular offerings at a great price, each successive $5 footlong from May to June to July has been getting worse and worse for the waistline. Perhaps this is a promotional move to sell a heavier sandwich during months in which most people are trying to slim down for beach vacations. My summer vacation may occur in September, so I challenge Subway to be more sympathetic and offer a lighter option in August and September so I can enjoy their featured sandwiches without sacraficing my waistline.